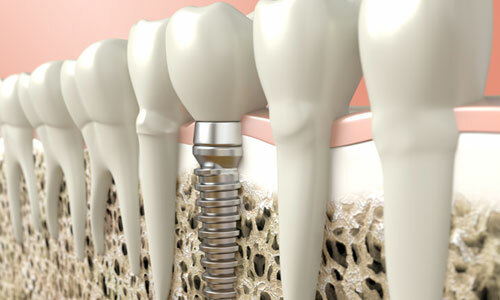 Since the beginning of mankind, people have used dental implants in one form or another to replace missing teeth. This fact underlines the importance afull dentition has on proper function and aesthetics. As P-I Branemark, who is considered the father of modern Dental Implantology said, the edentulous patient is an oral invalid to whom we should pay our respect and rehabilitation ambitions. Since the Toronto conference in 1982, during which the scientific results on Osseointegration of endosseous dental implants were presented, the area of Dentistry experienced a tremendous change of course with numerous important innovations which as a result benefited millions of patients. Today’s patients, with the use of Dental Implants, have the option of replacing their missing teeth with fixed, natural looking and feeling teeth instead of having to put up with uncomfortable removable prostheses. At Art of Advanced Dentistry all stages of Dental Implantology are being applied from the surgical to the prosthetic parts. Dr. Nicos Onisiforou a double specialist in Periodontics and Prosthodontics with extensive clinical experience in both the surgical and prosthetic parts of Dental Implantology, uses the latest techniques so that your Implant treatment can be completed within a matter of a few days and in some cases within a few hours as opposed to lengthy and complicated treatment schedules.This can be achieved by following the protocol of immediate placement and immediate loading of dental implants, a protocol which can be used in almost all patients. When the above techniques are used, the patient, in a matter of a few days, can get back his smile and is able to function again with self-confidence and comfort. The above mentioned protocol is also known as Same Day Implants or Teeth in a Day. Therefore, if you have any questions regarding dental implant therapy or if you are wondering if you are a candidate for dental implants, a consultation appointment with our dental specialist will answer all your questions and concerns.